Elvington Air Show in the middle of August seemed a long way off when we confirmed the booking but in no time at all it was time to get ready for the Show. 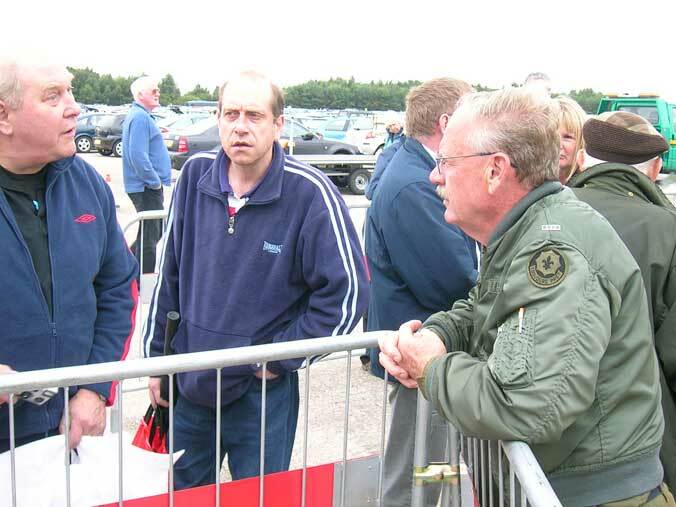 Ron Paye, a Veteran Cobra pilot from the 129th AHC, who had come over earlier in the year to see 509 for the first time, had decided that he would like to attend an Air Show with us and decided that Elvington was the one. Phil and I picked Ron up from Manchester Airport on the Wednesday before the show which gave him a couple of days to acclimatise to UK time. 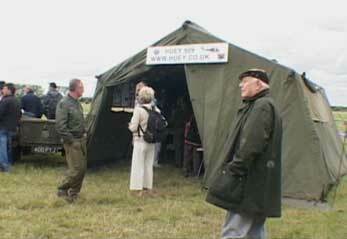 We had arranged for a 12' x 12' tent supplied by Evans Marquees in Lancaster ( http://www.evansmarqueehire.co.uk/ ) for us to use as our accommodation and act as a shop to sell Huey t-shirt, stickers, books, etc. I was to go ahead on the Friday morning in the Jeep with the tent, all the camping gear, etc to keep us going for the weekend in the trailer. 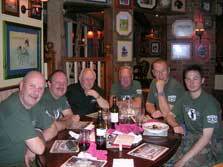 The flying crew consisted of Phil, Ron and Bradley. Neil and his dad were meeting us at Elvington and Nina and Jo were coming over by car later on on the Friday afternoon. After a three hour drive I arrived at a very windswept airfield. I made contact with the chief steward and those in control of the flying. I'd also met up with my parents who were keen to meet Phil and see the Huey for real having heard so much about them both. 509 flew from Wesham to Blackpool Airport to take on fuel. This took a lot longer than anticipated but eventually they were airborne by mid afternoon. About 45 minutes later they were spotted by us on the ground. 509 came in very gracefully and was parked on the grass by the side of the Dutch 414 and the crew tent. After a few discussions we decided where we would put the frame tent up which proved an interesting exercise as the wind did not let up! In no time at all it was home sweet home. Jo and Nina arrived, fortunately for us we had put the kettle on, so it wasn't long before we were all sat down with a mug of tea each admiring our new abode. Neil and his dad arrived as well, so the team for the weekend were all gathered and set off to eat at a local hostelry before Phil, Ron, Bradley and I returned to the tent and the girls and Neil and his dad set off for their hotel. Saturday dawned grey and a little damp. Soon the smell of breakfast was wafting into the tent as I set about cooking the bacon and eggs etc. It had the desired affect as Ron, Phil and Bradley soon emerged. From early on we had people coming up to us and asking about the Huey. Unfortunately from where we were you could only see the tail. As result of this we decided to change the position of the machine. The plan was to attach the ground wheels and tow 509 with the jeep to be close by the tent, but the ground proved too soft. So another plan was hatched - Neil was to fly the display and after landing we would then move the Huey on its wheels close to the fence that enclosed all the participating aircraft. This meant 509 could be seen close up by those visiting the show. Ron, Neil and Phil went to the pilots briefing and were given the flying times of the displays, the weather conditions etc. Throughout the morning a somewhat depleted number of aircraft arrived in dribs and drabs. 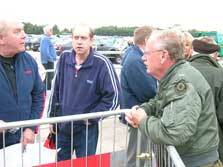 The weather was not conducive to flying; not just at Elvington but elsewhere around the UK . 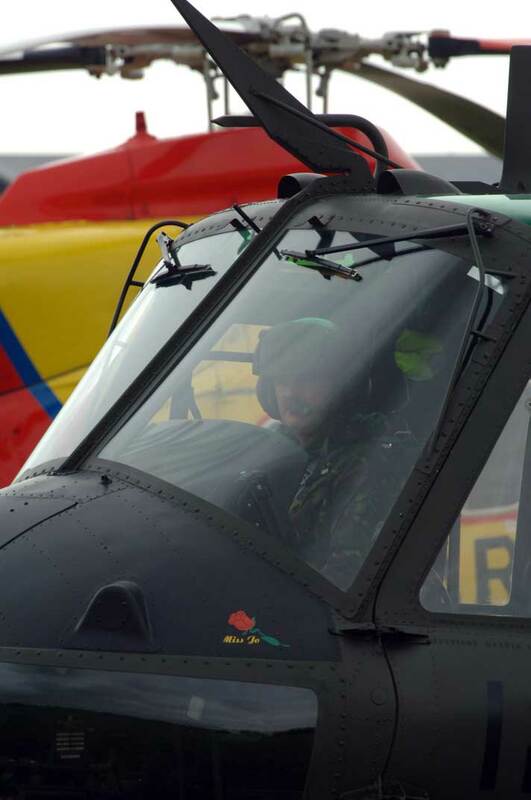 Neil and Phil went and did the preflight checks so that if the display time for the Huey was brought forward it would not cause us a problem. At around midday we started to prep 509 for the display. Neil, Phil, Ron and Bradley went over to empty the aircraft of anything that wasn't needed. I took the jeep over to ferry everything back to the tent. The 50 cals were put on their mounts and wired up to the electrics and connected to the gas system, both were tested and minor adjustments made to the gas mix. 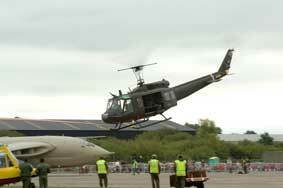 Elvington was going to be the debut for the Huey flying its display whilst firing the guns. The air display got underway with the conditions far from ideal, but the flying was impressive though unfortunately the number of aircraft available somewhat depleted. Soon it was time for the Huey to fire up. Ron stood proudly to attention and saluted as 509 lifted in to the air to do her bit. Neil gladly agreed to the request made by one of the 129th veterans through Ron, that the first two low level passes be done in memory of the 35 guys of the 129th who were KIA/MIA in Vietnam . Neil and 509 made a good impression with the crowd as they thumped up and down the runway with the guns chattering away. Ron was clearly delighted with what he saw. Ron was also very popular with the media. He was interviewed by the BBC from Leeds . He was also interviewed over the PA system for those at the show to talk about his experiences in Vietnam . He was interviewed by ITV the following day as well a second chat over the PA system. 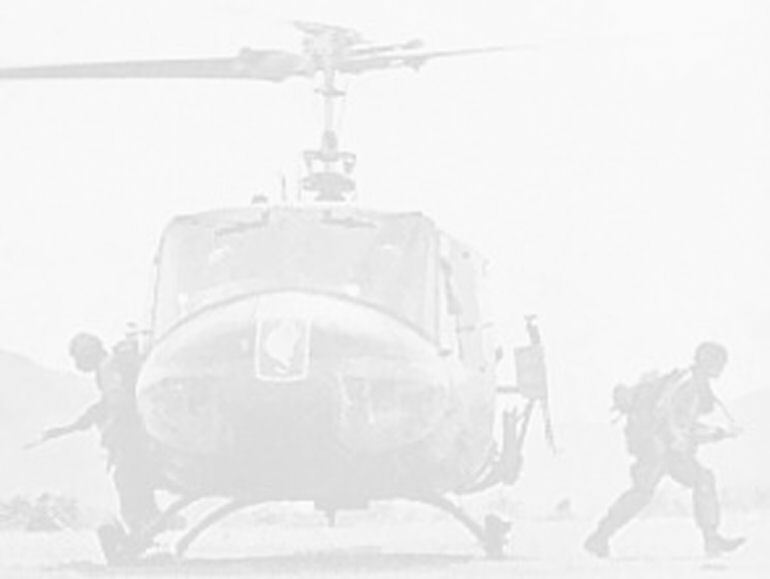 Once on the ground the team leapt into action and soon had 509 on her wheels and hitched up to the jeep. Slowly she was pulled up to the fence. A crowd was already gathered. Ron immediately stepped into the breech and started talking to everyone and handing out the Huey.co.uk stickers. There was a constant stream of people looking at the Huey and asking questions. The team took it in turns to field questions giving the others a chance to help Nina and Jo at the shop and to get a brew. The weather didn't get any better unfortunately for the organisers. As the crowd thinned out we locked up the Huey and began to make arrangements for the evening. Sunday morning was very damp. Neil's dad set off back home to Cumbria . I loaded up the jeep with our luggage as the others climbed aboard for the short drive to the airfield. We arrived and sorted out the shop and went in search of a cup of tea and a warm breakfast. Slowly the crowds started coming in, so again we took it in turns to talk to those that came to have a look at the Huey. Ron once again was talking non stop to those that came up. He was talking to them whilst he was at the shop as well. Much to his surprise Ron gave an interview for an Indonesian aircraft magazine. At the pilots briefing the timings had been brought forward so we readied the Huey for the display by moving her back to the flight line with the jeep. Once again the guns were connected and 509 after the preflight checks was ready to take to the sky as soon as we got the call. The cloud base was lower than the day before so Neil had to modify his display a little to cater for the lower clouds but still he put on an entertaining show, getting quite carried away with firing the guns. He did admit afterwards that he had thoroughly enjoyed himself. 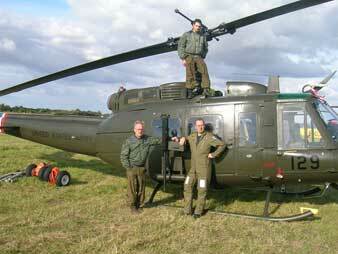 As soon as the Huey landed she was refuelled and we started to load some of our gear onboard and tie it down. For us it was a very rewarding and enjoyable weekend at Elvington, but we appreciate it was equally a very hard weekend for the organisers and a rather disappointing weekend for the paying public. Our thanks to Ken Cothliff and his team, Lewis Evans for providing us with the tent and to those who came to look at the Huey, we appreciate the interest you show in 509 and her history.